It’s now easier and faster to find the wealth of information on the National Library of Medicine’s main Web site. 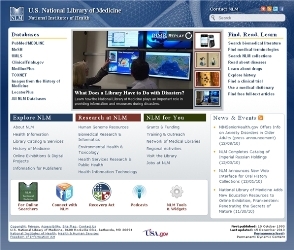 The NLM homepage, and thousands of other pages on the site, were redesigned and released on January 11, 2011 (1-11-11). To help people find what they want as quickly as possible, links to the most sought-after information are at the top of the page. The redesign team did an extensive analysis of usage patterns. The team analyzed customer emails, Web site customer satisfaction survey data, Web page usage statistics, and search engine logs. Based on the analysis, the homepage was redesigned with highly-requested content placed in two columns at the top of the page. One column lists the databases by name, starting with the most popular. That speeds up the process for people who know which database they want to reach. The other column lists the tasks a person may want to perform, such as “learn about drugs,” or “search NLM collections.” That helps people who know what they want to do, but don’t know where to go to find it. Navigation tabs were added to the headers of thousands of pages so people are just a click away from their favorite NLM links. A “share” feature was added so people can send content to friends, colleagues, or to themselves via social bookmarking and networking. Links making it easier to connect with NLM on Facebook and Twitter were added. The site-wide search mechanism was improved to include more search refinement options. A new page on regional activities was added, so people can find an NLM exhibition near them or an NLM booth at a professional conference. The redesign was a six-month collaboration between the Web and Information Management Unit, the Web Support Team, the Search Team, and the Audiovisual Program Development Branch. Additionally, representatives from divisions throughout the Library served as advisors. NLM published its first Web site (www.nlm.nih.gov) in 1993. It was one of the first US federal government Web sites. This is the fourth time the site has been modernized. NLM recently revamped several other Web sites. In July 2010, NLM redesigned MedlinePlus® and MedlinePlus en español®. Late last year, two other sites got new looks—the Disaster Information Management Research Center (DIMRC) Web Page and the National Network of Libraries of Medicine (NN/LM) Emergency Preparedness and Response Toolkit. NLM also refreshed the Specialized Information Services (SIS) site. January 19, 2011 in Featured Articles, Products.